Rosahl is a unique solid state dehumidifier with a host of advantages over conventional drying cabinet systems. Rosahl uses a small electrical charge across a solid polymer membrane to break down moisture and expel it from the enclosure. It is compact, has no moving parts, is silent in operation, requires no maintenance, draining or recycling and has a long service life. 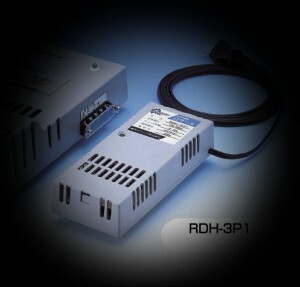 The RDH-3P2 is a lightweight moulded version of Rosahl that combines the solid state dehumidifier element and a power supply suitable for 220/240 V applications: it is not CE marked, but is RoHS compliant. A stand alone humidity control selectable 20 to 80% RH is also available, or the unit can be integrated into the cabinet’s overall control system.